Although you love your partner, what you feel for your in-laws isn’t exactly the same sentiment. To put it plainly, you really don’t like them. And you don’t have to like them. Although there is no rule that you have to like you in-laws in order to be in a happy relationship, you do have to figure out how to deal with them. When dealing with in-laws means suffering from anxiety or increased conflict in your relationship, it’s time to find a better way to cope with your new family. Many people find dealing with in-laws to be a tremendous challenge. Your in-laws may have strong opinions that you don’t agree with or interact with others in a way that is uncomfortable or offensive to you. Coexisting is a wonderful notion but no one said it was easy. For your own peace of mind and the health of your relationship, it’s worth thinking about how to find a sustainable way to deal with extended family. Although you know something irks you about your in-laws, the specific thorn in your side might elude you. See if you can pinpoint what exactly it is that irritates you. Do they have political, religious, or cultural values that clash with your own? Do they treat you or your partner in ways that feel disrespectful or critical? Is there something about their behavior that touches on a vulnerability for you? See if you can really name what it is to help you get clarity. When you understand clearly what the problem is, it’s easier to figure out a solution. Aisha and Ellen are loving partners, but Aisha doesn’t like her father-in-law. For starters, he voted for Trump and says things she finds sexist, racist and homophobic. When he starts talking politics, she gets upset and angry and tries to point out the flaw in his arguments. This, of course, never goes well. And further still, he treats his daughter like she’s a child. His treatment of her partner upsets Aisha very much. Ellen and Aisha often wind up arguing when they leave extended family gatherings. Ellen feels like she has to defend her father to Aisha, even though, she also doesn’t agree with his politics. She feels like she has to choose between her partner or her less-than-perfect father. Ken doesn’t like the large family gathering with his in-laws where they drink a lot and get rowdy. Ken and Chloe have a solid relationship but he often feels alone when they spend time with Chloe’s parents. Even though Ken doesn’t come from a family of drinkers, his family life was volatile. At times, there were intense emotional outbursts. These moments often resulted in displays of anger that were scary to him as a child. Chloe tends to drink too much and get loud when they are hanging out with her family as well and this upsets Ken. He feels alone and anxious during these family gatherings. Have you had similar experiences? To help you manage time spent with extended family, here are 4 ways of successfully dealing with in-laws. Although it can take a little finesse in discussing this with your partner, let them know that you’re having a hard time spending time with their family. The goal in discussing this topic is to become a better team in dealing with extended family. Remember that you’re not opposing the in-laws, so try not to insult or blame them as this may put your partner on the defense. Also, keep in mind that your partner may not see anything wrong with their family’s behavior. Instead, try to focus on how uncomfortable you feel in dealing with in-laws. Let your partner know how much their support means to you and how they can best support you when you spend time with family. Even small moments of connection together like a quick kiss in the bathroom or a gentle hand squeeze under the table can help you in tense moments. Try to not make it so your partner has to pick sides. Think of it as recruiting support rather than positioning for battle. In dealing with in-laws, one of the most important things you can do as a couple is to hear each other out with love and compassion, remembering that you are committed to each other’s well-being. Your priority is your relationship as a couple as well as your comfort levels together when you are with the in-laws. If you can each be sensitive to each other’s needs, it may make the time spent with in-laws much easier. Although it might be tempting to wish for your in-laws to become easier people to deal with, don’t set your sites on it. Hoping and waiting for them to magically change only leads to frustration and disappointment. For example, if your father-in-law thinks Trump is the answer to our country’s problems, you won’t change his mind. Even with the most eloquent, persuasive, and meaningful defense, he’s going to continue wearing that Trump t-shirt. The same goes for the heavy drinking family. They aren’t going to stop imbibing because of you. The family will most likely continue doing its thing. Remember every family has its own culture and way of doing things. Even if their way is dysfunctional in your opinion. When you met your partner, the two of you created your own relationship culture, one that reflects your shared values and preferences. Though parts of family origin, culture, and traditions will influence how you and your partner live, you get to choose what works for you and what doesn’t. If you’re not crazy about your in-laws, take comfort in knowing you’re not alone. 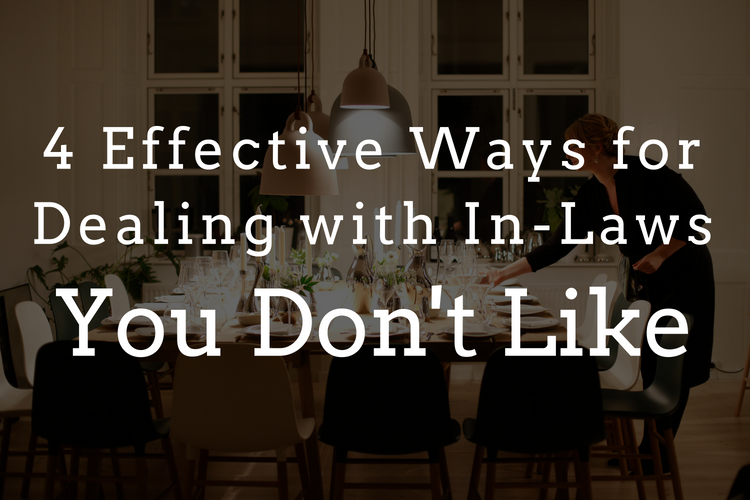 Actually, disliking your in-laws is incredibly common. After all, you fell in love with your partner and committed to them. You certainly didn’t fall in love or commit to their critical mother or controlling father. So don’t think there is anything wrong with you for not being fond of your extended family. Rather than pushing your feelings down or criticizing yourself, see if you can practice Radical Acceptance of both your in-laws and your response to them. Acknowledge your thoughts and feelings instead of ignoring them or pretending like they don’t exist. Also, it’s normal for your partner to have their own complicated relationship with their family. All families have history and history creates unique emotional layers. The added layers of family complexity will require skillful navigation at times. Spending time with others can be taxing. Especially when your time is spent dealing with in-laws. To help ward off this drained or disconnected feeling, sandwich your family gatherings with nourishing activities. See if you can schedule something comforting before and after the family event. If you are traveling to see your in-laws, try to schedule in a day before or after the family visit that is just for you and your partner. Take this much-needed time to do something you both enjoy, away from the demands of family time. It doesn’t take an extended vacation to nourish yourself or nurture your relationship. You can just make time for things like getting a massage, taking a long bath, or going on a hike. If you are staying with your in-laws for a few days, it’s especially important to steal a little time away for yourself whenever possible. Even just some time at night with a good book can help. Find something that nourishes you and connects you to you. Consider staying at a hotel or Airbnb instead of staying with your in-laws if possible in the future. Another tactic is simply to avoid hard topics. Steer the conversation away from contentious topics like politics, religion or child-rearing. Topics like these tend to turn fiery very easily, so focus on more neutral ground. *Need help dealing with in-laws?